Kikay Corner > Kikay Tech > Are You Ready? March 31 is World Backup Day! Are You Ready? March 31 is World Backup Day! Did you know that March 31 is World Backup Day? I don’t know about you, but these days, you do not need to be a blogger to know that you have to get your files backed up. I learned this early on when Yahoo Photos closed down on September 2007. It was three years prior when we discovered the convenience of digital photos. Imagine losing three years of precious photos. It was then that I learned the importance of backing up my files. Fast forward to 10 years after, the value of backing up has magnified exponentially even as file sizes get larger and larger. While photos then only take up a few hundred KBs, now, with the ever-increasing byte proportions of images due to the innovations of High Definition (HD) technology, each photo has now grown to a file size of 2MB or more. According to Mylio’s estimates, more than 14 trillion photos will be taken in 2017, basing on a prediction that there will be 7.5 billion people in the world. So multiply 14 trillion photos by 2MB and you’ll get 28 petabytes (28 with 15 zeroes) of photos just this year. An IDC Digital Universe Study said that as of 2011, the amount of information created and replicated will exceed 1.8 zettabytes (1.8 trillion gigabytes). ▪ Items to backup: Your computer, laptop, phone, iPod, tablet, other wireless devices, photos and videos on social networks. ▪ Common ways to lose data: Theft, hardware failure, natural disaster, alien invasion, obsolete file formats, you forgot where you put it (really, it has happened). ⁃ Local backup: An external hard drive that can be easily retrieved at home. ⁃ Having both local and offsite backups gives you piece of mind knowing your files are safe and secure. ▪ check your backup procedures & restores to make sure everything is up-to-date and working. All these considered, I personally have made it a point to back up my files using my own hard drive. I can conveniently store and make my files easily accessible using Seagate’s 2TB portable hard drive, claimed to be the world’s thinnest. 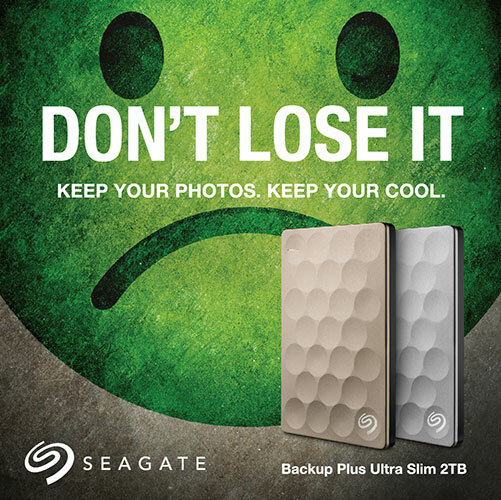 Don’t be an April Fool, backup your data. March 31 is World Backup Day.